Cedar waxwing on native chokecherry. For the 171 species of birds migrating annually on the 2,000 mile journey along the Mississippi flyway, Chambers Island is a haven, a rest stop, and a much needed place to refuel. 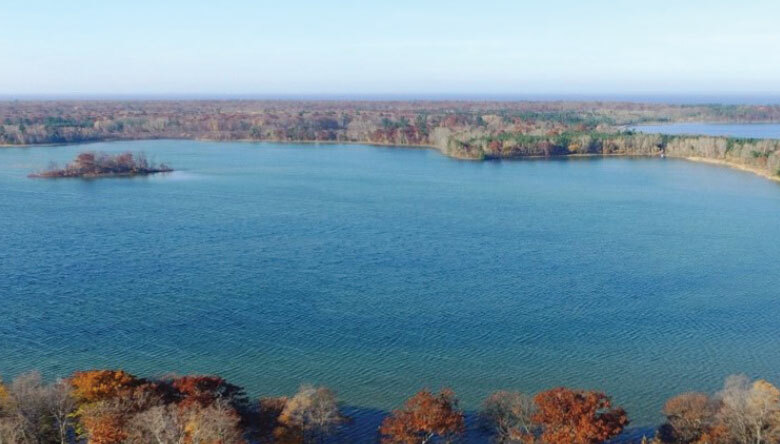 The Door County Land Trust Chambers Island Nature Preserve has grown to 600 acres and our 2018 plan continues efforts to acquire several key parcels, including the two small island within Chambers’ interior Lake Mackaysee in partnership with the Town of Gibraltar. In addition to continuing land protection efforts on the island, this year the Land Trust is partnering with landowners on Lake Mackaysee to improve habitat along the shoreline by removing the invasive plant, Phragmites, thanks to funding from a Cellcom Green Gifts Grant and matching member contributions.